Hello TT & J readers! I’m Kristin from Yellow Bliss Road and I’m thrilled to be a contributor this year!! Tatertots & Jello was one of the very first blogs I found and loved and I’m so honored to be a part of the team this year. You can catch me here each month sharing a fun and fabulous free printable! With Easter on it’s way, I have created some fun Easters printables to help you jazz up your Easter celebrations this year. I have been obsessed with glitter recently, which my friends will tell you is rather odd because I kind of hate glitter – it’s messy. 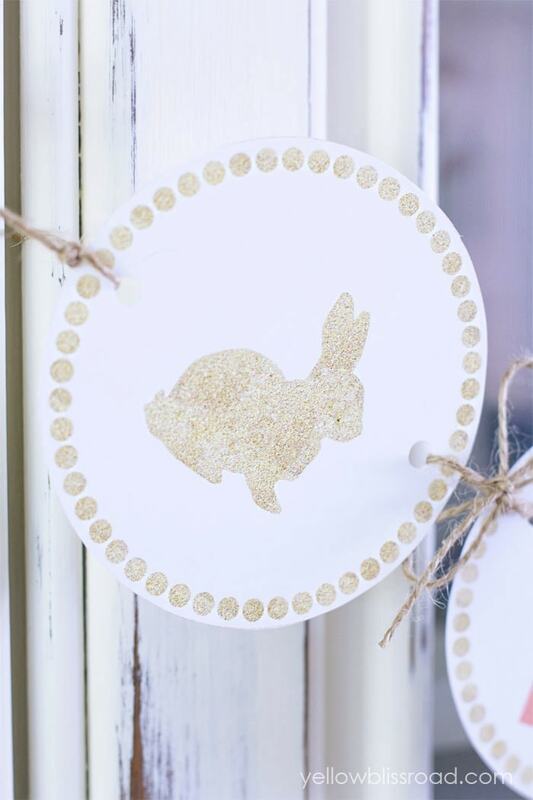 But this kind of glitter – the printable kind – is kind of awesome. And completely mess-free. That’s my kind of glitter! If you’d like to print this banner for yourself, you can click on the link below to download it. Just cut out the pieces and tie them together. You could also tape or hot glue to a ribbon or string. Then just hang it up. 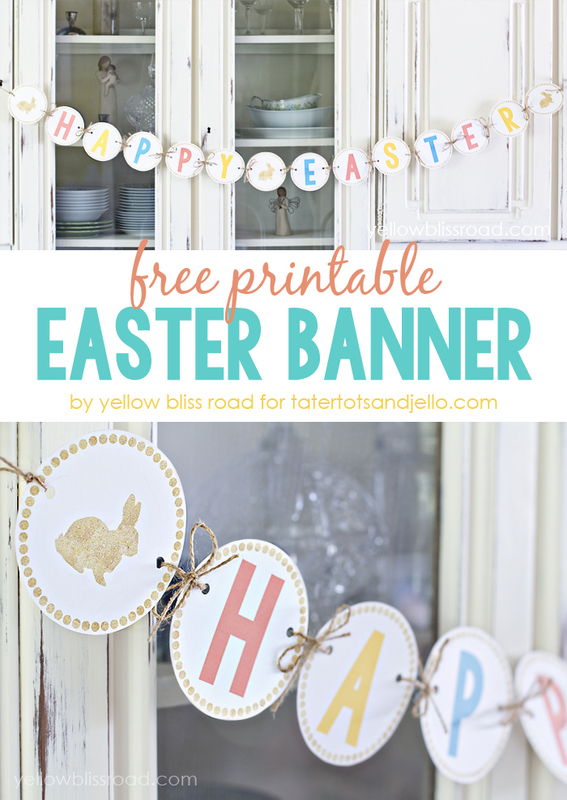 Love the colors in this printable banner? I’ve got some fun accessories to compliment it! “Hop” on over to Yellow Bliss Road to grab some free printable straw flags, cupcake/snack toppers and an Easter Egg hunt sign! *please keep in mind that all of my free printables are for personal use only, and are not to sold or redistributed. Thanks! She has lots of one pot recipes on her blog, and this Easy One Pan Spaghetti and Meatballs looks so yummy!! 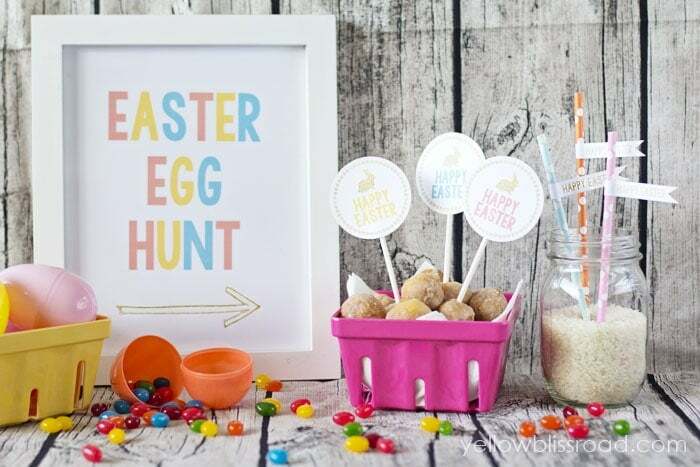 Her Spring Mantel and Chalkboard Easter Printable are such a perfect combo! I love the bright flowers with the chalkboard print! Can you believe the last day of school is right around the corner? Well, these Free Last Day Printables would be perfect for documenting the last day of school!! I just love Kristin’s style, and I’m so excited to have her as a contributor this year! I can’t wait to see the other awesome printables she shares with us this year! I posted a comment earlier that the link to the printable for the banner wasn’t working, and I got an email saying it was fixed, but it’s still not working for me. When I click on the “click here to download” image I am taken to a screenshot of the “click here to download” image. Thanks! When I click on the “Click here to download” button, it just shows me the picture of that saying it doesn’t take me to the banner download. Is there another link I am not seeing? Thanks! Sorry — the link was wrong but it’s working now! Thanks!! Jen recently posted…“Let’s Go Fly a Kite” Spring Wreath Tutorial!! The download link for the banner isn’t working. Love the banner! So much that I want to print it, but, unfortunately, your link just takes me to a screenshot of the “download here” image. Can’t wait till it’s fixed so I can run to Staples and print this off! Great job! Natalie @ A Turtle’s LIfe for Me recently posted…Easter Peeps Recipes!